Paint Pouring is another new addiction that I recently started along with using Alcohol Inks on rocks. I love discovering new ways to paint rocks. I recently got enough courage to try acrylic paint pouring on rocks. I still consider myself a beginner when it comes to rock painting or painting in general, even though it’s been over 3 years since I painted my first rock. I’m still learning new ways to be creative and art has been a positive outlet for me. I always wanted to try paint pouring but I was intimated by the preparation process and clean-up, but before I began my big art project I needed to do some research. So what is Paint Pouring? 1. Before starting to prep paint with a flow medium, go ahead and get all your supplies out and ready. 2. Have a clean workspace where you can prep, create, and leave the rocks to dry without moving them. Transferring the rocks to another location can cause the more rounded rocks to roll around and ruin your rock art. 3. When prepping your area, cover your table with plastic sheeting or cutting up a garbage bag with work too. 4. Keeping an art journal with the weight measurements of each color with flow medium will help you keep track of what you use, in case you love the color combination. Using a basic kitchen food scale will make this process simple. 5. Have kids? I have a very active 3-year-old boy and finding time to do this was a challenge. Little hands like to touch everything, so I choose a block of time when I was kid-free to try this for the first time. It made my experience less stressful and more fun for me since I could just focus on my first paint pouring project. A base for rock. You can use anything from wide bottle caps to an upside-down egg carton, it just needs to be big enough to hold your rock above the surface area for paint runoff. 1. Place your rocks on bottle caps inside a foil pan or something disposable. 2. Start preparing your paint cups. Choose the colors you want to work with and pour each color in its own cup. Mix in the pouring medium and stir with a craft stick. Mix just enough pouring medium to thin out the acrylic paint for pouring. The paint cannot be too thick, it needs to flow over the rock. The paint should be able to coat the mixing stick but still be able to drip off smoothly. 3. Making the Dirty Pour. Use a larger cup and start pouring the paint into small amounts creating a layering effect with all the colors. Once all the paint is emptied in the “pour” cup, the magic begins! 4. Begin pouring the Dirty Pour over the rock slowly in your desired pattern to cover the entire rock. 5. Oooh and Ahhh Moment! 6. Let your rocks dry for at least 2 to 3 days before moving or sealing. 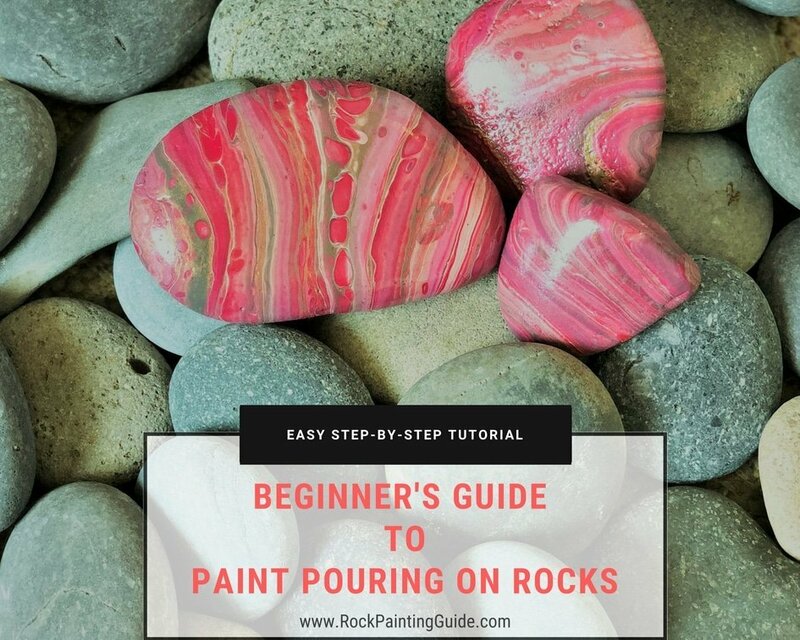 Moving the container of the paint poured rocks can cause the more rounded rocks to shift and fall of the base, ruining your beautiful painted rock. Check out the Youtube Tutorial for Paint Pouring on Rocks! 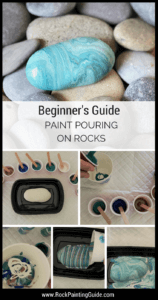 I hope you found this tutorial for Paint Pouring on Rocks helpful. Another fun way to paint rocks is by using Alcohol Inks! Here’s another easy tutorial for Using Alcohol Inks on Rocks. Check out the Artist Toolbox Essentials for my favorite rock painting tools and more! 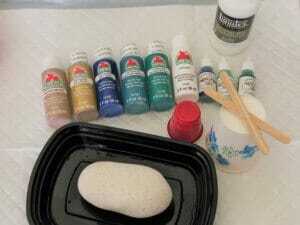 Rock Painting Guide’s Pinterest Boards for lots of new rock painting ideas. Be sure to join and share your creations in our Facebook Group for others to admire! Don’t miss another Rock Painting Tutorial, Sign up to get it sent to your inbox!